I Was Ordered To Undergo An Independent Medical Examination (IME), What Is It? If you have been requested to undergo an IME. Your lawyer will supervise the process and ensure that the doctor is not biased and is not acting in the best interests of the insurer. On behalf of Koszdin, Fields, Sherry & Katz posted in Workers Compensation on Friday, July 27, 2018. Doctors play a crucial role in every workers’ compensation case. It is something nobody can deny. But your primary treating doctor’s opinion may not satisfy your employer’s insurance company or the claims administrator, which is you may be ordered to undergo an independent medical examination (IME). “However, your primary treating doctor’s evaluation may be disputed by the employer’s insurer or judge, which is you may be ordered to go through a medical evaluation with another doctor, the practice referred to as an independent medical examination,” says our Lancaster workers’ compensation attorney from the Koszdin, Fields, Sherry & Katz law firm. Why were you ordered to undergo an Independent Medical Examination? In the vast majority of cases, an employer’s insurance company requests an independent medical evaluation when it does not agree with the injured worker’s treating doctor’s evaluation or disputes certain issues in the doctor’s opinion, especially when the doctor believes that certain expensive procedures and treatment will be necessary for recovery. These IMEs can significantly affect the legal success of your workers’ comp claim and how much you will receive in compensation. An independent medical examination, which, in theory, should be performed by a neutral and unbiased medical professional, is intended to resolve any disputed questions about your medical condition, treatment, and recovery. 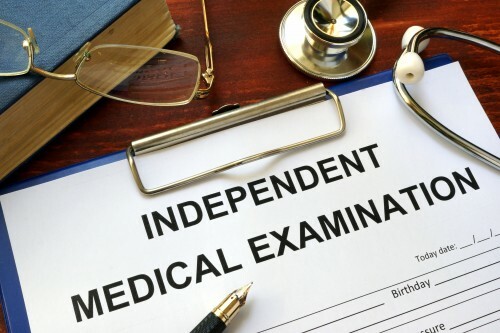 An insurance company is not the only party who has a right to request an independent medical evaluation in case there are any doubts in the evaluation or opinion of your primary treating doctor. A workers’ comp judge or hearing officer may also order you to undergo an IME to ensure that your condition or disability has been correctly diagnosed, establish that the injury or illness is work-related, and resolve other disputed issues in your case. Who chooses the doctor for an independent medical evaluation? “If my insurer does not trust my primary treating physician, then how do I know that I can trust the doctor selected for an independent medical evaluation?” you may be wondering. It is true that the choice of a doctor for an independent medical evaluation can affect the outcome of your workers’ compensation case, as it is not uncommon for insurers to select the doctor who will perform the IME. After all, all the insurance company wants is to minimize the costs in your case and pay as little as possible, and the doctor selected for the IME may be their tool to do so. That is why hiring an experienced workers’ compensation attorney in Lancaster, Van Nuys, Los Angeles, and elsewhere in California is critical if you have been requested to undergo an IME. Your lawyer will supervise the process and ensure that the doctor is not biased and is not acting in the best interests of the insurer. Another question that bothers injured workers who have been ordered to undergo an IME is, “What happens during these evaluations?” In general, an independent medical evaluation is no different from the evaluation you received from your treating physician. In fact, some IME doctors choose to review your primary treating physician’s evaluation before the examination, while others prefer to examine the patient first and then review another doctor’s evaluation. “Also, this is something no insurance company will mention to you, but be careful what you say to your IME doctor during the evaluation,” warns our Lancaster workers’ compensation attorney. Do not expect a normal physician-patient relationship during an independent medical evaluation. Your statements to the IME doctor may be used against you during your workers’ comp hearing to invalidate your case or lower the compensation. Schedule a free consultation with our lawyers from the Koszdin, Fields, Sherry & Katz law firm to find out more. Call at 818-812-5639 or (toll-free) 800-747-3447 or complete this contact form for a free case evaluation.